21st Century Fund "Grant Program"
Competitive grants of up to $1,000 are offered to Missouri historical and genealogical societies, libraries and archives for projects to compile, index, preserve and or publish local records. Since 2009 MoSGA has funded several projects throughout the state. If your local Missouri historical or genealogical society, library or archives has a project in mind to preserve and/or publish records, please encourage your society to apply for a 21st Century Fund Grant. To apply, use our online form, print it, and mail. Click here for the form. For Guidelines, click here. 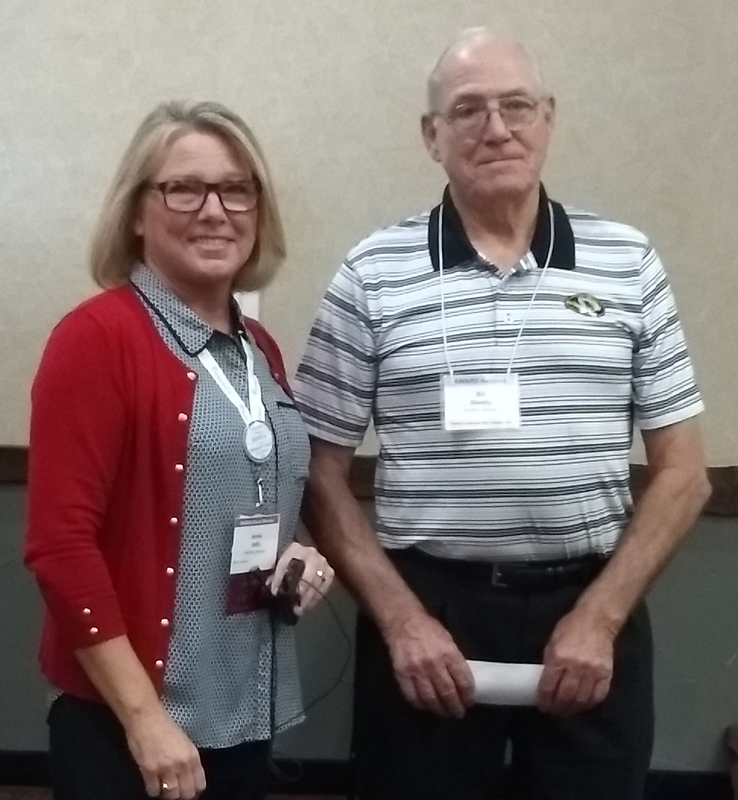 Grants are awarded at the annual MoSGA Conference – usually held in August. For additional information please contact the 21st Century Fund Committee. 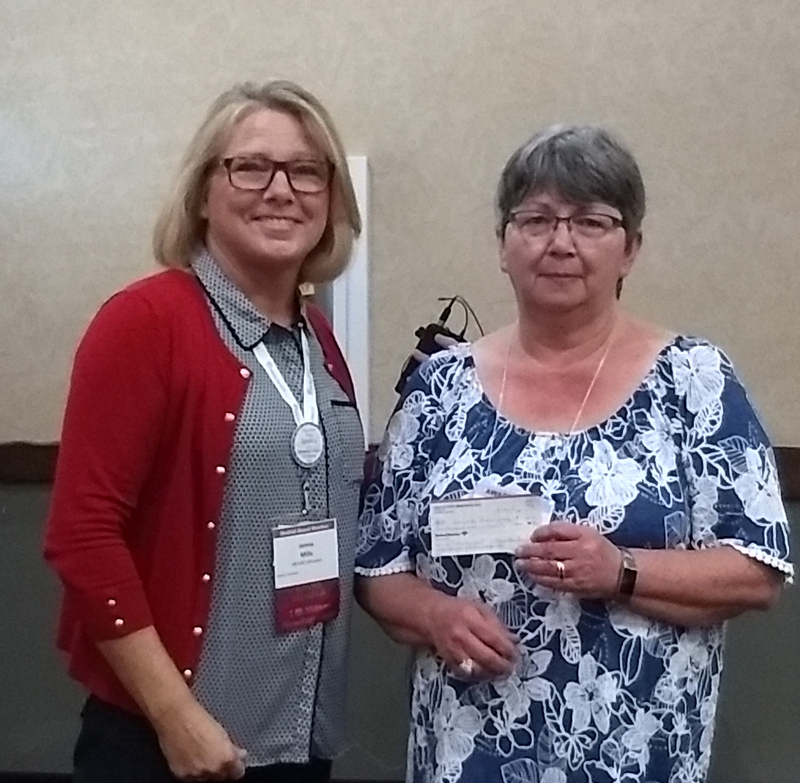 Three $1,000 21st Century Fund grants were awarded at the 2018 Annual Conference. LEFT: Bill Sheey accepts the grant on behalf of Iron County Historical Society. CENTER: Linda Brink & Estella Morrison accept the grant on behalf of the Excelsior Springs Genealogical Society. RIGHT: Rhonda Simpleman accepts the grant on behalf of the Carrollton Public Library. 2016 The St. Charles County Historical Society received a grant of $990.00 to purchase a sheet-fed scanner to digitize St. Charles County records. 2015 Arnold Historical Society - $500 to help publish a book on the pioneer Richardson Cemetery in Arnold MO. Cedar and Vernon County Genealogical Society - $500 to help publish a three volume set of the Walker (MO) Herald newspaper, 1882-1931. Will Mayfield Heritage Foundation - $500 to purchase archival supplies for the historical collection of Will Mayfield College in Marble Hill MO. 2014 headquartered in High Ridge MO, received a grant of $475 for a pilot project to digitize Jefferson County church records. The Northwest Missouri Genealogical Society in St. Joseph MO received a grant of $900 to purchase archival boxes to process and store Buchanan County court records. The Phelps County Genealogical Society in Rolla MO was awarded a grant of $625 for archival boxes and folders to store loose issues of the Rolla Times newspaper. 2012 - Holt County Historical Society was awarded $796 to purchase equipment to digitally record and preserve their collection of family histories, obituary files, photos, and slides. Phelps County Genealogical Society was awarded $328 for the purchase of archival storage supplies to inventory and preserve records recently rescued from the Phelps County Circuit Court. 2011 - The Friends of Miami, Inc., in Miami, Missouri received a grant to purchase archival supplies to preserve their town records. The original town of Miami, located on the Missouri River in Saline County, is one of the earlier settlements (1817) in the State of Missouri. Once processed, the town records will become available to researchers. 2010 - The Morgan County Historical Society in Versailles, Missouri received a grant to purchase archival supplies to preserve, organize and display their county’s school records dating from 1846 to 1961. Donated to the society by the Morgan County RII School District, these significant local records are now available to researchers. 2009 - Butler County Archive in Poplar Bluff, Missouri received a grant to purchase acid free pamphlet files and supplies to organize a growing number of donated genealogical materials. Local volunteers organized the family histories, genealogy magazines, research books and pamphlets. The materials are now available to researchers. Scott County Historical and Genealogy Society in Benton, Missouri received a grant to support the research and preparation for a publication on county landmarks. The book will cover the period from 1822, when the county was established, to the present. The Society plans to interview senior citizens, search local newspapers and probate records for documentation on the estimated 75 county landmarks.